Snom 320 Now with Backlit Display! Last week, ProVu held a Snom Training Day at our Savile Mill offices, Huddersfield. For the first time, attendees on the course were given Snom 820 Executive VoIP Phones to use and take away in order to explore all the wonderful things about VoIP and Snom. The day was a great success, with demand exceeding the number of places available. Due to this, a further ProVu Snom Training Day will be held at the beginning of June. ProVu Snom Technical Guide - "101 Things You Didn't Know a Snom Phone Can Do". The day will be hands on with real-life examples and practical demonstrations. Questions are encouraged with lots of participation. Reserve a place. More information and training day agenda. In February we announced ProVu had acheived Cisco Select Partner Status. As a result, ProVu are now able to distribute Cisco branded phones. The Cisco SPA-525G is the first in the range of the innovative new 5XX series from Cisco. Though similar to the Linksys SPA-9XX range in appearance, the SPA-525G boasts many more advanced features suitable for the small business market. The Cisco SPA-525G also follows the same provisioning, firmware and web interface as the SPA-9XX range from Linksys, Cisco Small Business. All new models of the Snom 320 VoIP phone now come with a backlit display fitted as standard for the two line LCD display. The Snom 320 is an affordable, yet powerful SIP business telephone. In order to choose which Snom VoIP is most suited to your requirements, the Snom Range Comparison Table is the perfect tool. Use the Cisco WIP310 WiFi phone for business quality VoIP calls over a Wi-Fi network with wireless handset convenience. The WIP 310 supports the latest VoIP technology protocols, allowing you to take phone calls anywhere within the range of your wireless router. With the wide spread success of our ProTalk SARK UCS platform, we have put together a demo version of the software for our resellers to evaluate. Developed in the UK by a team of experienced telephony experts, SARK UCS has many unique features that we believe gives it a substantial advantage over its competitors. Coupled with our in depth one day technical training course and on going technical support, the ProTalk SARK UCS platform will enable our resellers to add value and develop additional revenue streams from both sales of hardware and support. With Snom OCS Edition, every current Snom VoIP phone can be integrated with Microsoft's Office Communications Server 2007. Snom OCS edition supports open SIP standard, working within your existing IP PBX. Place secure calls both from your computer via Microsoft OCS or from your Snom phone. Snom OCS Edition is available exclusively for specific projects. If you are interested in deploying Snom OCS Edition phones, please contact us to discuss the special firmware release. 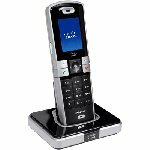 Many people are still unaware that the Siemens Gigaset range of IP DECT handsets and base station offers full interoperability. Though some will prefer all the phones to match one and other, just like you may deploy different models of the Snom range dependent upon the needs of each user, the same can be done with the full Siemens Gigaset range. Register either any combination of up to six handsets or five handsets and one HC450 Door Entry System with one base. The C475 and S685 base stations also have a digital answering machine. This feature is still supported when you register an A58H. ProVu have a number of demonstration Snom, Siemens and Linksys products available at very reduced prices. All products are of high quality and available for next day delivery. Please note that these items are subject to a reduced warranty period and no technical support is included with the purchase.